Is the criticism accurate? Sure. Absolutely. Instagram Stories is very clearly heavily "inspired" by Snapchat, and I doubt a single soul at Instagram would deny the striking similarities. Then again, it's also worth noting the team at Instagram probably doesn't really care how similar their Stories is to Snapchat's Stories (they even share the same name, for crying out loud). But what does it all mean? What does it mean for Snapchat? What does it mean for individual users? And, most importantly, what does it mean for advertisers? These are the big questions right now. The most important detail in this entire equation is the numbers. 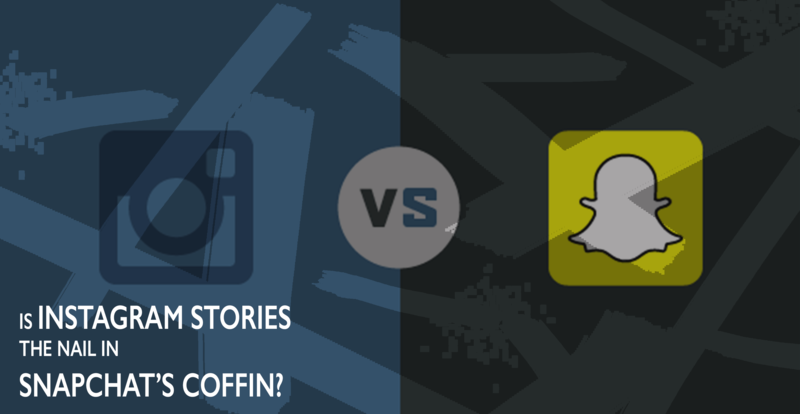 Instagram absolutely dwarfs Snapchat with its roughly 300 million daily users, vs. Snapchat's 150 million. That may not sound like too big deal, but if you're an advertiser, the difference is tremendous. For instance, Nick Sheingold, the associate director of strategy at Laundry Service (one of the agencies Nike uses), told Ad Age their first Instagram Story got 800,000 views in 24 hours. Comparatively, on Snapchat, Nike's most popular video ever received a measly 66,000 views. In case you don't feel like doing the math, that's over 12 times more views on Instagram than on Snapchat, just in their very first post. No other brands have gone public with their viewership numbers yet, but we'd imagine the story is similar across the board. So many of the issues Snapchat faces have absolutely nothing to do with Instagram. From the very beginning, people have been baffled by Snapchat's user interface. There's a lot of swiping, some tapping, some finger jabbing, and--if you're me--straight up phone throwing that goes into navigating one's way through the app. Once users figure out how to find their way around the app, they realize that adding friends is even more cumbersome. Despite Snapchat's being around for years now, they still haven't implemented a thorough search function. Ugh. Naturally, that's not to say that Snapchat doesn't have its benefits. Early on, Snapchat benefited greatly from the fact that people saw it as a genuine, real-life look into the lives of other people. For this reason, celebrities, athletes, politicians, musicians, public figures and people in the spotlight have garnered massive followings on the app. This eventually piqued the interest of advertisers, who in recent history have done their damnedest to creatively invest in the platform. But Instagram may have just brought those wheels to a grinding halt. Instagram is More User and Brand Friendly. Snapchat has made a massive push for its advertising platform in recent months, but it still only allows premium placement on its app for just a few select publishers and brands. Mashable, Food Network, CNN, National Geographic, Wall Street Journal, ESPN, VICE, and MTV are some of the top advertisers on the platform's "Discover" tab, but smaller businesses or brands are frequently left out of the equation. There are also a bunch of supplemental advertisements that come between personal snaps, and some brands leverage the Snapchat's unique format exceptionally well (seriously, Chubbies, good job!). Nevertheless, Instagram was the better pick for brands before its most recent bombshell. The release of Instagram Stories is almost certainly going to have an impact on Snapchat's bottom line. How severe? Well, that remains to be seen. 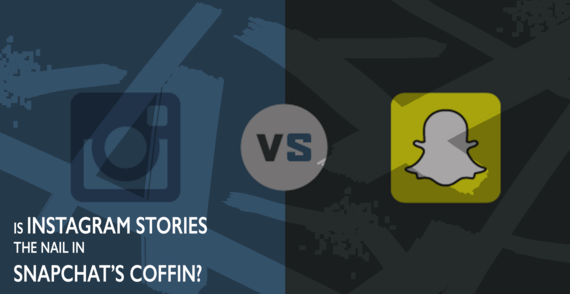 When push comes to shove, how is Instagram's new Stories feature going to impact Snapchat? It really all depends on where you're looking. For personal users, it's still a little too early to tell. Instagram Stories displays at the very top of users' feeds, which gives them priority over other content right now. The individual engagement on Instagram Stories seems great so far, and like Nike, we have seen an excellent level of engagement on the RushOrderTees instagram. At the same time, Instagram Stories is still in its infancy. Snapchat's user base is already relatively well fleshed out, and its product is far more robust than Instagram Stories. I mean, with Snapchat, you can turn your face into a strawberry. So uh, there's that. And snapchat still has other wacky and wild filters, its slew of trusted publishers, etc. That's not to say that Instagram Stories won't quickly corner that market as well, but for the time being, for individual users, Snapchat's Stories is better than Instagram's Stories. For brands and advertisers, however, the question isn't even worth asking: Instagram wins. Period. It has twice as many users, which means at least twice as much reach. Of course, if Nike's numbers are any indication, brands could expect absurdly higher reach on Instagram. Instagram also offers a simpler and more user-friendly interface, and makes advertising accessible and easy for brands of all sizes and budgets. At Rush Order Tees, social media and creative content is a huge part of how we interact with our customers, so it's something we tend to take seriously. We've always felt better about using Instagram over SnapChat, mostly because our efforts on Instagram are more quantifiable and longer-lasting. We're personally excited about Instagram Stories because we think the process of screen printing, along with all the other services we offer, is something a lot of people would like to learn about, but seldom have the resources. Brands who are active on Snapchat gained popularity for their less polished, more behind-the-scenes material, and that's exactly the kind of content we intend on posting to Instagram Stories, all in concert with our traditional feed. We can't really say for sure who's going to win out in this battle for best social sharing platform, but it does look like--from where we're standing, at least--Instagram is trying to go for the jugular.